Home / ESD Grounding Methods / How Do Shoe Grounders Work? How Do Shoe Grounders Work? Answer: Shoe grounders use the conductivity of carbon (the black part) to bring electrons to the ground. Static electrons can sit on the surface of our skin. The charge can then accumulate on us with greater mass if we are electrically isolated from the ground underneath our feet. Charge accumulates when we are wearing shoes- like tennis shoes or other rubber-based footwear- that are insulative. Insulators can hold multiple positive and negative charges in pockets across their surface for hours. The safest way to ensure that static on you is reaching the ground is to bypass your shoes by tucking the silver ribbon into your sock. 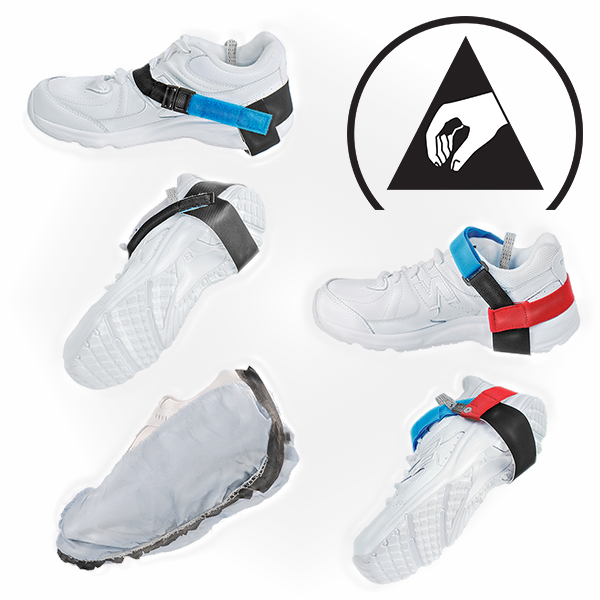 Wearing a shoe grounder establishes a path for electricity to travel directly from your skin’s surface through the shoe grounder, and into the floor. Wearing a shoe grounder ensures that you are electrically bonded to the floor. Heel Grounders are a specific type of shoe grounder that use a conductive black carbon rubber heel to ground you. Connected to the rubber heel is a conductive silver thread that tucks into your sock. The thread draws static electricity from your skin’s surface so that it grounds static clinging to you. If you are worried about static electricity, you should not be working on electronics while standing on insulative materials like carpets or wood floors. However, even if you are using conductive flooring, you should be wearing shoe grounders so that your shoes are not an insulative barrier that stops the static on your skin and clothes from discharging into the floor. Keep in mind that materials like wood and carpets are insulators. Wood floors and carpets can easily cause us to hold static on our skin and clothes. However, this means you should be wearing the heel grounder while standing on a grounded surface- either a floor that has been treated with static dissipative or conductive paint or a floor padded with ESD Safe matting. This way, you know the surface is not stopping the static on you from dissipating into the ground. If you use matting, it can be either mat roll laid out as “floor runner” or a conductive mat. These mats can be connected by mat ground to an electrical outlet. Shoe grounders should be worn and tested regularly if many people are working near electronics frequently. A charge can build up on clothes, skin, the floor, and tables causing unexplained machine shutdowns and device failures. One study conducted in the 1980s found that as much as 75% of their unknown device failures were attributable to ESD. To test shoe grounders, you would typically use a tester with a single metal plate. ESD test equipment, like the combo tester, is itself typically setup to meet the requirements of ESD TR53. Based on TR53, most testers are by default set up to look for a reading from the shoe grounder of less than one gigaohm ( 1 x 10e9 (1 billion or 1,000,000,000)ohms resistance). A reading below one gigaohm guarantees that the shoe grounder is, at a minimum, static dissipative. 1. Western Electric North Andover Works (1983). “ESD – How Often Does It happen?” G.T. Dangelmayer, EOS-5, pp.1-5, 1983.